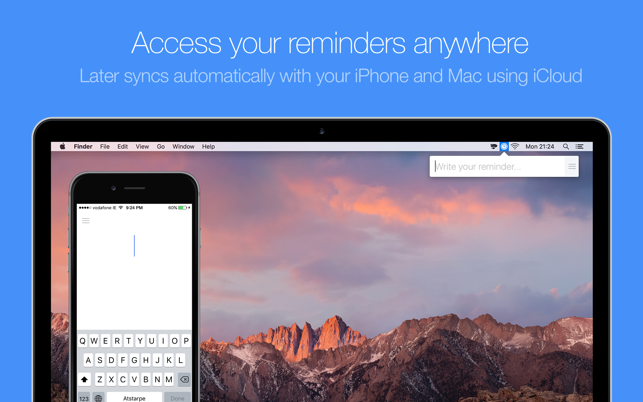 Download our free iOS app to sync your reminders and even add reminders that appear when you're back on your Mac. "This is exactly what I needed. No feature bloat, no bells and whistles, just one tap to set a "don't forget to do this" then one more tap to choose when to be reminded. No more late night emails to myself!" 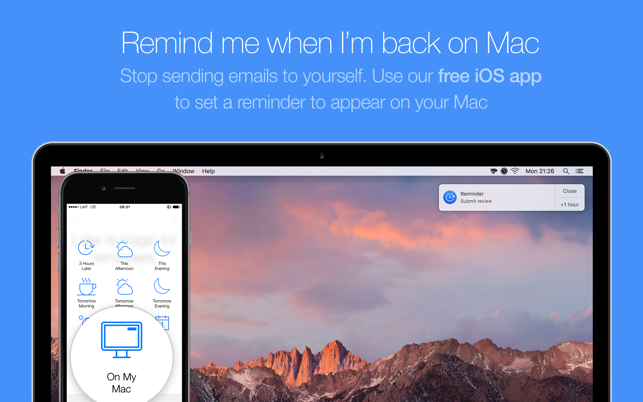 If you send an email to yourself whenever you want to schedule a reminder or find that other reminder apps just have too many options to add a simple reminder, Later app will be ideal for you. We love your feedback! Send it to us at support@laterapp.co or using our app. Learn more and see FAQ on www.laterapp.co. * Get our iOS app for free to make the most of Later Mac! Search iOS App store with “Later Reminders”. Really wonderful for just getting things off the mind! I love this app because it is bare bones simple. If there is something on your mind, just add it to Later and set a time for when you want to be reminded about that thing. My favorite part of it is that as soon as you open the app, you’re immediately typing so that thing that is fresh in your mind can come striaght out and be written down. Highly recommend it for anybody who just needs to dump ideas/thoughts/tasks but doesn’t have time to go through and schedule everything in the moment. Most convenient reminder app there is! I work at my computer for the typical 9 to 5, and with the hotkey, this makes it super easy to add a quick reminder to follow-up on either when I get back from lunch, this evening, tomorrow, etc! 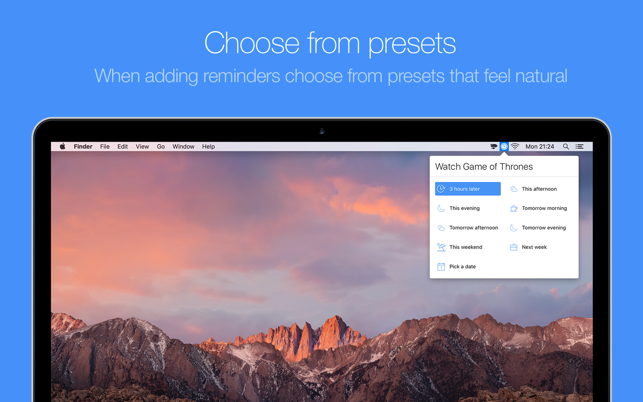 It’s all about the presets yo! The iCloud syncing is seamless and quick. A better way to be reminded of reminders that have since-passed. I know that you can go back into the list and see the older ones “greyed out”, which is handy — but it would be cool if there was some sort of “persistent / nagging snooze” that you have to deal with before it goes away (kind of like Due). All in all, I love these Developers — I use their other app Characters daily too! Trust me, this is worth the money!